Yes my friends, that is a sleeping bag that looks like a tautaun from Star Wars: The Empire Strikes Back, and this is no joke. Remember when Han and Luke were stranded in the snowy desert of Hoth? Han used Luke’s lightsaber to cut open a tauntaun and sleep within it’s warm guts. 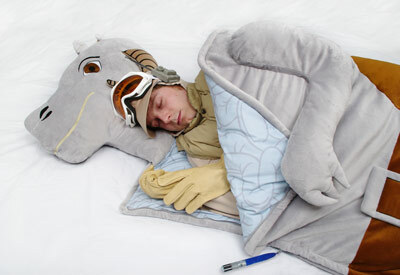 Now your child can experience that awesome moment with the tauntaun sleeping bag. It comes complete with a lightsaber zipper, because there is absolutely no other way to open up your tauntaun. It also has a printed organ pattern on the inside for that extra bit of detail. You can sleep in a tauntaun for $99.99 on ThinkGeek.com. So you’ve read all of this? You must be a Star Wars fan. Here’s a little something special for you. The deeper you get into this video, the funnier it gets. I love how pleased the guy is with himself. Superb.